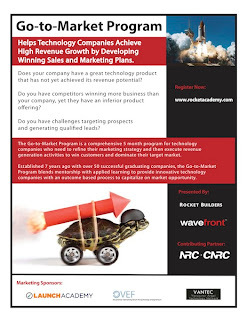 The Go-to-Market Program (also known as the Market Readiness Program) helps technology companies develop skills to maximize successful execution in market entry, product launch and revenue growth. The program is designed for technology executives (CEO, VP Sales, VP Business Development, COO, and CFO) who are responsible for revenue growth. The Market Readiness Program is offered to groups of companies concurrently to maximize the potential of peer discussions and peer review. Custom training programs for a single company are possible, and in the past elements of the curriculum have also been licensed for company or channel training manuals. If you wish to reserve a spot in the upcoming program for your company, please fill in the form found here. For more details on the program in Alberta, please visit Innovate Calgary or TEC Edmonton.